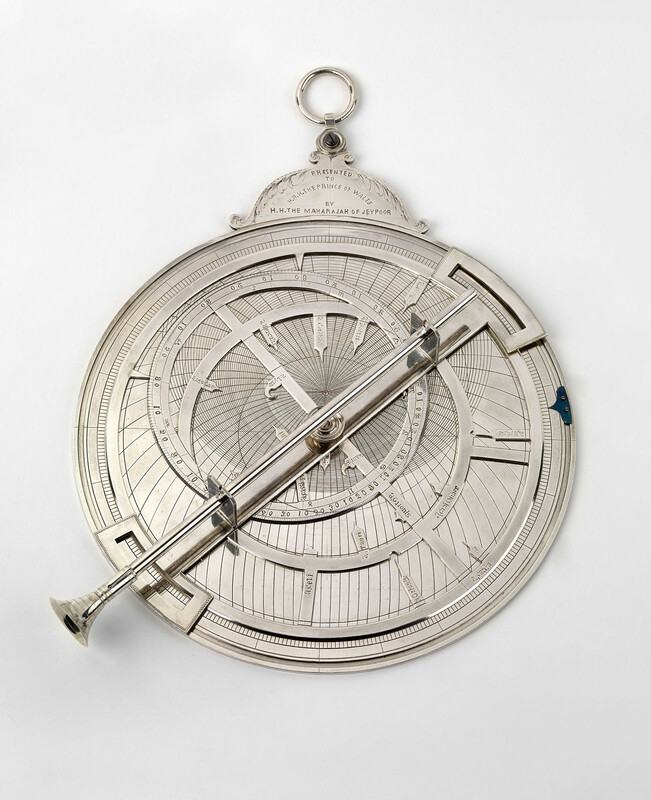 A silver astrolabe with a tubular eye-piece. Astrolabes are used to measure the position of stars and planets. In Sanskrit, the astrolabe is referred to as the yantraraja which translates to the 'king of instruments'. Astrolabes were introduced into South Asia by travelling Iranian scholars and the production of the instruments was fostered by the Tughluq Sultans (1320–1410) in Delhi and the Mughal Emperors from the mid-sixteenth century in Lahore. The astrolabe was also patronised by Hindu rulers notably Maharaja Jai Singh II of Jaipur (1688–1743). During his reign (1699–1743), Jaipur became a prominent centre for the production for astrolabes and his avid interest in astronomy led to the construction of five astronomical observatories in Jaipur, Delhi, Mathura, Ujjain and Benares (now Varanasi).